D&D Off Ramp – Why These Three? As we continue to talk about the off ramp from D&D, I want t discuss two ideas. The first is the difference between leaving a game and abandoning a game. There is a weird paradox in gaming where we interpret the idea of leaving a game as criticism, but celebrate the discovery of new games. The reality is that actual abandonment of games is much rarer than adding another game to the list of those you play, and in that sense, “leaving” a game is a very positive thing. It means you’re trying something new, and more games in the world is a good thing. Yet we still wrestle with that knee jerk sense that these things are zero sum, so I want to call out that when I talk about leaving D&D or pathfinder or d20, I mean it in the positive sense, not in the sense of discarding them. Second, kind of leads into the point of the piece. When I propose 13th Age, Numenera and Dungeon World as the D&D off ramps, that is not the same thing as saying they are the only good options available out there at the moment. We are living in a golden age of fantastic games, and while the three games I’m discussing are all great, the reasons I have selected them are tangential to their general quality level. They each have a specific thread which, I feel, can be followed from 3.x to end up there. For a historical perspective, consider Vampire. When it came onto the scene, it was a lot of people’s first game, but lots of other players came across from games like D&D. But other than the fact that they were both games, there was no real natural progression from D&D to Vampire. It was just a jump. And so would it be to go from D&D to Cortex Plus, or Hero, or Savage Worlds or, yes, even Fate. There is also a totally unfair element of timing to this. Green Ronin has two games (Dragon Age and Song of Ice and Fire) that could legitimately make a case for being potential off ramps based on their content, but they came out to early (and there are other complicating factors as well). It makes me sad because I love both games, but I just don’t think they’re in the mind at the moment. So speaking of timing, why do I think now is the time? Three factors, and I’ll just own up that the first is intuition. It feels like it’s time, and it feels like D&D Next is about a year behind where it needs to be to catch the wave. The second is that while Paizo continues to put out great stuff, it’s definitely a very mature line at this point. The Pathfinder RPG is a solid foundation and fanbase, but the things they’re going to be exciting us with over the next year or two are things that progress from that foundation (like, say, Pathfinder Adventures). The third is that there is clearly energy in the fanbase. Numenera and Dungeon World came out of Kickstarter, and 13th Age’s first supplement was also kickstartered. Importantly, all three saw fan response that indicated a lot of pent up demand. Now, admittedly, this is not strictly limited to these three games, but they definitely ride that wave (and in the case of Numenera, it’s kind of critically telling). So all that said, why these three games. 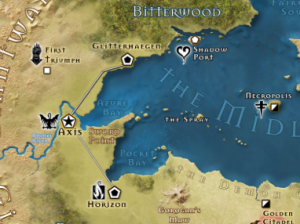 Numenera is probably the most and least obvious. Mechanically and stylistically it has the least overlap with D&D – it’s technofuturism with a system whose only overlap with D&D is the use of a d20. How is it an off ramp? And the answer to that it, honestly, Monte Cook. Cook was the first guy to really get the d20 PDFs moving, and he’s steadily and consistently built a fanbase who respond to his particular view of D&D. I don’t want to dismiss his design skills, but they are largely overshadowed by his vision and his ability to share that vision. He is taking the step away from d20, and he’s bringing along several thousand friends. Dungeon World is somewhat more obvious, since it is in many ways a specific distillation of the “D&D Experience”. It is probably the smallest off ramp of these three because it has no big names associated with it and it’s one of those weird Indie games, but for a certain segment of the populace, those things are benefits, not drawbacks. Dungeon World is a very disruptive games, with a very different way of handling play, but it frames it all through very familiar D&D tropes. This may be hippie, semi-abstracted narrative-layer translation stuff, but it’s hippie, semi-abstracted narrative layer translation stuff wrapped around hitting orcs with swords. This may not seem like a big thing, but I feel it’s a large part of why Dungeon World often overshadows Apocalypse World, the game it’s based on. If you’re not familiar with Dungeon World, there’s no way I can explain it fully in the space available, but the big reason I consider it an off ramp is that it provides a very essential D&D experience with a lot of the fat cut out. Some might argue that it got some muscle as well, and the reality is that it’s not a game for everyone. But for the gamer looking to push their boundaries while still fitting in a D&D shaped box, this is probably the way to go. So Simon from Pelgrane actually commented the other day, and shared a little bit o 13th Age background, and specifically that it genuinely grew out of the designer’s own d20 game (rather than back-grafting d20 onto the ideas of the game, which is how I thought it felt). I totally believe this, but it does not diminish my sense that 13th Age really has pushed d20 past its bounds and into the realm of something else. Yet despite that, it still has the familiar patterns of d20. In fact, the text is pretty clearly written as someone’s second game after some D&D. If Numenera is an inobvious off ramp, 13th Age is basically lit with great green neon letters pointing the way. Take your D&D knowledge and use it to do more and different stuff! And in each case, the answer is a little bit different, but framed similarly. If you really like the experience of D&D – crawling through dungeons, hectic fights, weird magic – but want maybe a little less crunch and you want to try something really new and different then try Dungeon World. If you really like D&D, but you just want to push your experience a little further, and you really like playing someone who’s a mover and a shaker and really an important part of the setting, then go with 13th Age. 1) What is in it that the D&D player is going to resonate to? 2) Is the game currently alive, active, and non-insular enough to catch their eye? 3) Is it different enough from Pathfinder to catch their eye but not so different as to cause whiplash? If you have good answers to those points, I’m totally open to them, but this is not open season for your favorite game. So, go to – convince me this stool needs another leg! There are no wrong answers! Except Fate or Savage Worlds. Those are totally wrong answers. This entry was posted in Uncategorized on September 17, 2013 by Rob Donoghue. In the midsts of my 13th Age writeup, I made a tweet that I promised some follow up on. The gist of it was that Numenera, 13th Age and Dungeon World represent a trifecta of post-d20 gaming. I promised I would elaborate on the thought, and so I shall. I kind of wish I had the stamina to give Dungeon World a treatment similar to the one I gave 13th Age and Numenera. It’s a great game and deserves the love, but I also feel like a lot of what needs to be said about it has already been said by other people. If you’re curious about 13th Age or Numenera, I’ll shamelessly point to my own posts, but if you need to know more about Dungeon World, I will mostly point you at Google (though suggests for reviews will be welcome in the comments). So, let me start with a premise: d20 was a big deal. I don’t think anyone would argue with that, but I want to focus on something that gets less spotlight. 3e was much more radical than a simple improvement on 2e, it transformed the game into (and introduced a generation to) a game framework. To illustrate what that means, it helps to look at how TSR (then WOTC) produced other games, especially back in the days of Boot Hill and Gangbusters. Those games had many conceptual similarities to D&D, but were structurally very different. This is because the rules of D&D were, essentially, non portable. You could technically use them for non-D&D things, but doing so required a lot of closing your eyes and hoping. Similarly, the addition of a new class (or similar) was an almost entirely self contained process because there was no structure to hook into. You’d throw together some stuff and hope it worked right (or, as was more often the case, that it wasn’t grossly overpowered). With 3e, there was a clear framework that the rules fit into. There was a small set of core rules, and everything expanded on that. If you added a new class, you had a scaffolding to build on, whether it was to expand D&D or to build a game in a whole new genre. Importantly, it was not a true generic system, in the way that games like GURPS and Hero are. Those were broad flexible systems where the system could be expanded to cover any situation. That is subtly but critically different from the framework model, which sacrificed that breadth in favor of modularity. That is, if I added a space pilot to my D&D game, I have not changed or expanded D&D beyond the self-contained rules of this character. If In GURPS. adding the space pilot would be a subset of adding space rules. In any case, the introduction of this idea was a big deal, and paired with the OGL, it was very influential on game design. This idea of not needing to rewrite your game for every new thing while at the same time not needing to have a truly generic game became so common as to be expected. So, fast forward a bit. 3e matured into 3.5, and then matured further into 3.75 (aka Pathfinder) while WOTC proceeded with 4e. Now, no sleight to 4e – I like it, but it’s not the topic here – but it did not supplant 3e the same way the 3e had 2e. Pick your favorite reason for why this is so, there are lots to choose from, but whatever the cause, a lot of the 3.x fanbase chose not to move on, and instead continued to polish and refine the engine. Which brings us to where we are today. I feel it is safe to say that at this point in time, the 3e engine is very mature. Not to say there’s nothing left to do with it, but I’d suggest there is less left to do than has been done. Sure, there will always be new content to be excited about, but the body of 3.x is pretty near its final form. This is not me saying that it’s time to put 3.x out to pasture. That would be obviously nonsensical – Pathfinder continues to rock out. But as it matures, more and more gamers are going to reach a saturation point with it. Maybe they want to try a different game. Maybe they want to simply buy different products. Their reasons will be their own, and their numbers will be subject to debate. However many they are, there are gamers out there looking for an “off ramp” from 3.x (arguably, I might call it an off ramp from D&D, but that’s contentious) – the game to go to next. It’s possible that if D&D Next knocks it out of the park, the off ramp may be an on ramp right back onto DDN, but in the absence of that, the question is what off ramps are available. If I’ve played a lot of 3.x and I’m ready for the “next thing”, what am I going to gravitate towards? My argument is that the three strongest off ramps are 13th Age, Numenera and Dungeon World. And, interestingly, each offers a meaningfully different kind of off ramps with different focuses and experiences to offer. So why those three and not something else (like Fate, if I’m feeling self serving)? Well, that’s what we’ll get into tomorrow. This entry was posted in Uncategorized on September 16, 2013 by Rob Donoghue. 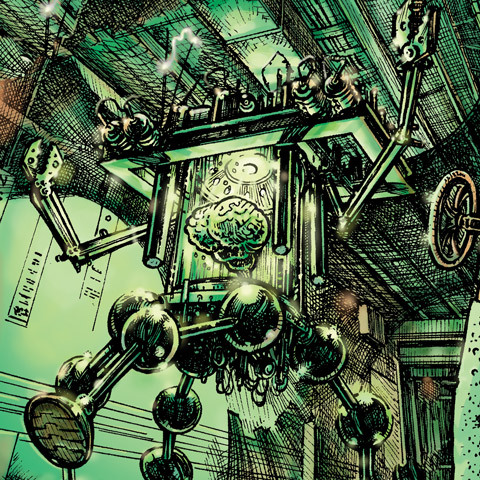 The Monsters chapter is another fun one with lots of great pieces of technology in it. It opens with the information needed to read a monster stat block which reveals two interesting things. First, monsters do fixed damage, something I imagine makes bookkeeping much easier on the GM side. The second (and more interesting) is the presence of triggered abilities, which work like flexible attacks – they’re effects that are triggered by the creature’s roll. This is an innocuous passage, but it’s implications become obvious as soon as you start looking at the monsters. See, monsters only have a few possible attacks (only one in many cases) and the theory seems to be that you can have special attacks be triggered rather than forcing the GM to make tactical decisions on the fly, especially where very nasty abilities are concerned. In theory, a well designed monster effectively has an implicit “script” to its behaviors based on how it rolls. For example, the Chimera makes three attacks per round (a lot of monsters have multiple attacks, often with the C abilities providing extras as quick actions) to represent its three heads. But rather than track each head and its special abilities, you can determine that based on the roll. If it rolls a 14–15, then you’re dazed from the goat’s headbutt. If it rolls a 16–17 then you take extra damage from the lion’s claws. If it rolls an 18–20, then it makes a fiery breath attack. Now, while this does simplify many things, it does introduce a different sort of bookkeeping, so it may not be to everyone’s taste, but ideally this can greatly simplify running fights with interesting enemies while still allowing for wild and crazy stuff to happen. That’s the theory at least. The actual monsters themselves are a bit more uneven. Most every monster has a default melee attack, but some have other options. They might have a ranged attack (Noted with an R) which is reasonably self explanatory, but they may also have a close attack (noted with a C) which seems to kind of be a wildcard, with the qualifier that using it does not trigger an opportunity attack. Since the C abilities tend to be weird and potent, it tends to introduce its own complexities that undercut the elegance of the triggered abilities. It’s not a bad thing, just kind of a shame because I admit I really dug the scripting idea (and, in fairness, lots of monsters do script just fine, just not all of them). Ok, so before we hop back into the monsters themselves, lets jump back to the surrounding rules. This section explains how mooks work (1/5 HP, damage spills from one mook in a mb to the next) and has the good taste to explicitly nod to Feng Shui for the naming convention. There are also Large and Huge creature which explicitly call out why so many spells are tied to the target’s hit points – it’s to keep you from being able to cheese the big ’uns. And then there are burrowing rules because I guess they had to go somewhere. There are fewer sections on Monster special abilities than one might expect. There’s an interesting bit on “last Gasp” saves, which are basically the PC’s chance to avoid instakill effects, which are moderately generous. There are also rules for fear auras, which are keyed to hit points. I actually dig this, though it’s pretty nasty – it means Fear aura don’t matter much when the fight starts, but they become more important if things go badly. After that are guidelines on how to read a monster’s statblock. It’s largely self-explanatory, but there are a few interesting tricks. First, there aren’t much in the way of monster illustrations. Instead, the monsters have tile art which evokes a particular icon’s tile art. This suggests a relationship, though the details vary and may be elaborated in the monster’s text. There’s not much mechanical heft to this, but it’s interesting, and resonates interestingly with player’s icon relationships. It is, however, another area where the game leans heavily on the reader’s previous exposure to monster art. Second, there are often options for nastier versions of the creatures, though this is not particularly reflected in the rules for building battles (which are conveniently/redundantly repeated here for reference). The actual monsters themselves are exactly what you would expect them to be – it’s the d20’s greatest hits. I went through and checked a few touchpoints – Kobolds are suitably annoying, Dragons are suitably scary and the Medusa has great mechanical clarity(this last is a real triumph). It’s a good spread, and much like 4e Monsters, every monster has some manner of schtick that keeps it feeling unique, so Orcs feel different from Gnolls feels different from Kobolds. Finally, there are guidelines for creating your own monsters as well as levelling up existing monsters. These are practical and clearly presented in a series of charts, and they seem pretty workable. Most importantly, there is a section on what abilities to avoid in designing a monster, especially calling out the need to take care with defensive abilities as they tend to slow fights down without much return. All in all, the monsters chapter is a lot of fun. The triggering attack mechanic definitely gets the biggest workout of the lot, but there’s a fair balance between clarity and diversity which – I believe – does the job well. This entry was posted in 13thAge and tagged 13 Age on September 4, 2013 by Rob Donoghue.